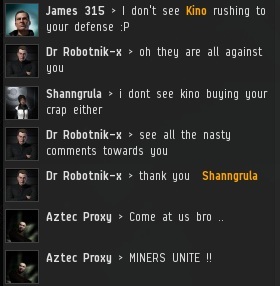 Previously, on MinerBumping... An intense debate broke out in the Kino system. Rebel Dr Robotnik-x declared his intention to "protect" the miners from the New Order by using his Drake. Lacking the firepower to stop the Invincible Stabber from doing its work, Robotnik fanned the flames of discontent with his propaganda. He questioned the honour of the New Order, if you can believe that. Robotnik and his fellow rebels expressed a negative philosophy. They stood against the New Order, but they didn't stand in favor of anything. 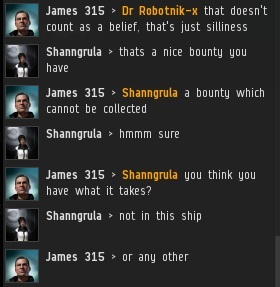 Tempted by the immense bounty that stands uncollected, Shanngrula entertained fantasies of taking a crack at me. Would he give it a try? No, he would not. After a few moments, the adrenaline died down and Shanngrula reconsidered what he was saying. He promptly took himself off the chess board. Robotnik couldn't understand why Agents of the Order would do something other than PvE for isk all day. To open his mind, I asked him a few probing questions about his practice of yellowboxing people with his Drake. He was convinced that by locking me, he was boldly attacking the New Order. My curiosity intensified. The "carebear stare" is one of the most common ways that rebels try to "fight" bumpers. But since locking a ship doesn't stop it from moving, it tends to be ineffective. Hopping from one Miner Bingo square to the next, Robotnik changed his mind. 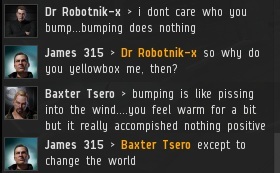 He didn't care about the bumping after all. 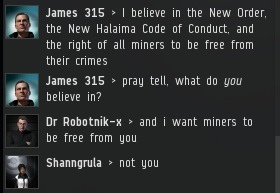 It doesn't do anything to the miners, except stop them from mining. Why would a miner care about that? Over the course of our conversation, I came to realize that Robotnik was a baby rebel. He lacked experience, and was exploring these issues for the first time. He groped blindly around the "extortion" square, never quite saying the word. With nothing to believe in, and without the ability to accept the New Order's power, Robotnik drifted into nihilism. I feared he would become an out-and-out denialist before long. Agents of the New Order, particularly bumpers, have elevated multitasking into an art form. As I educated the Kino system and reasoned with Robotnik, I continued identifying and prosecuting bot-aspirants. 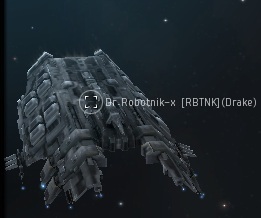 Robotnik still followed me in his Drake, locking me when he got into range. He encouraged William Ijonen not to buy a mining permit, but he was helpless to stop the bumping. William was on holiday from his keyboard. With Robotnik's Drake struggling to devise an appropriate countermeasure, William's Procurer was at my mercy. He glided into the darkness. Robotnik was disgusted. 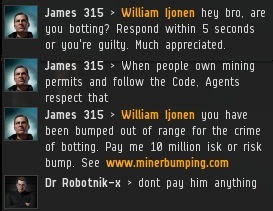 I made a casual reference to the hundreds of mining permits I've sold (over 4 billion isk worth, to date, even at my generously low prices). The denialism creeping in, Robotnik refused to believe that anyone has ever bought a mining permit. 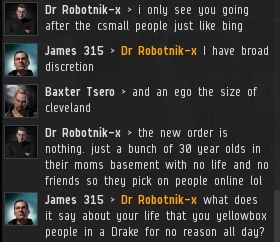 After the rebel forces of Kino lost the Battle of William Ijonen's Procurer, they had no choice but to reassess their strategy of relying on one yellowboxing Drake. To stand any chance against my Invincible Stabber, they would need to join forces and form a united front against the Order. But could they? Aztec Proxy > The new order is nothing but small kids with their parrents VISA ! If there's one thing that rebel miners are adept at, it is projecting themselves onto others. 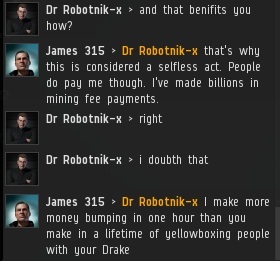 "I make more money bumping in one hour than you make in a lifetime of yellowboxing people with your Drake" - that's pure gold right there. I was drinking Dr. Pepper when I read that. Then I laughed and got the little bubbles up my nose. I hate that. Strange, so was I, minus the bubbles up the nose bit. Cleaning up my keyboard and monitor as I type. Pure gold, I wounder how many cats would it take to relieve him of that ship? I'm surprised this Robotnik guy even manages to operate a personal computer. Dr Robotnik-x is falsely representing himself as someone who helps miners. 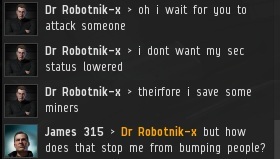 He should be petitioned as someone who is breaking the Eve TOS. No, no they could not. They never could. They never will. These bot-aspirants are literally NPCs - non-player characters. There's no player at the helm, no one home to care or unite or rebel in any meaningful way whatsoever. Bots do not form alliances or united fronts, they just run their programs day in, day out, until the servers shut down. Purge them, brothers. Purge them all in the name of James 315! Worse, the ones who try to unite and rebel, are found with absolutely no backing, because the uniters are people at the helm but the audience are elsewhere. So when you do get valid resistance movements, they're ineffective and cannot act in a meaningful way because the bot-aspirants don't join or give the guys any real teeth. Those players who have teeth, aren't going to help those who refuse to even try, while the resistances want to defend those exact same people. Probably doesn't help if the leaders aren't terribly good at leading, be it from lack of experience, charisma, or such. Forgot to add: End result is the same boring, tired conclusion we see with every resistance thus far, with little entertainment value whatsoever beyond the initial attempts because there is no actual conflict between the New Order and an opposing force. 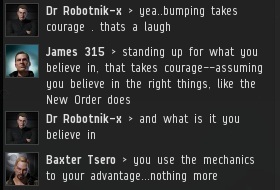 Anyone who has the spark to make and actually unite people around an Old Chaos (or whatever anti-NO faction name they can think of) is more likely than not either already supporting the New Order or doesn't care for the bot-aspirants. Well, depends on how you look at it, I guess. It's not worse for the New Order that there is no useful resistance, as you can do your work saving High Sec in relative peace. The afk and bot-aspirant are too busy not playing to care that it could be worse for their perspective, as the presence of a useful resistance could mean someone else is fighting for them. 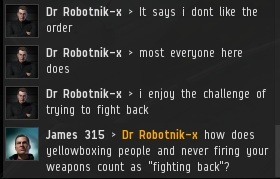 Then again, they're also too busy not playing to realize even if someone was actually fighting for "their" High Sec. For the outside third party who garners entertainment from conflicts like major wars and battles and similar pewpew events, the inability of the rebels to make a suitable resistance and source of conflict makes High Sec worse as a source of entertainment. At least there's post-ganking tears to derive some laughs from in the meantime. But for the ones trying to rally and unite, the fact that these bot-aspirants don't even try to listen and group up is definitely worse. The uniters are, from my point of view, trying to get the miners to stand up for themselves and each other, to participate in their own "liberation" from the New Order and gankers in general, and no one is biting. Their attempts are futile, and it's sad and pathetic, really. 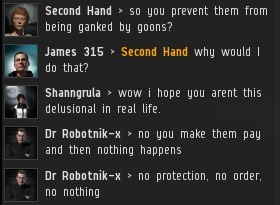 They cannot act alone; EVE is not a solo game. They need people to unite under a common banner so they can fight together. If James 315 worked alone, High Sec wouldn't be as partially saved as it is. The New Order succeeds because James was able to gather others to his cause, and this is what I feel the rebels are trying - and failing - to do with the disgruntled miners. As one of the third party who reads this blog for entertainment, to me the lack of an opposing force that can actually do and mean something is worse. I'm personally pro-Order, but I want to see these rebels - if they're not going to realize that the NO is playing the game and the bot-aspirants aren't and join you guys- at least form up and organize into a proper resistance organization with teeth. 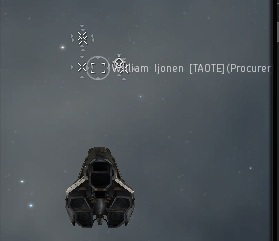 Either way, they'll be playing the PVP, multiplayer, aspect of EVE. The aspirants' refusal to do so, even with like-minded trying to get them to do so, is worse. "But for the ones trying to rally and unite, the fact that these bot-aspirants don't even try to listen and group up is definitely worse. " "As one of the third party who reads this blog for entertainment, to me the lack of an opposing force that can actually do and mean something is worse." The baseline for comparison, the scenario which Sjonnar describes, also does not contain listening and grouping up, or an opposing force that can actually do something; therefore it's still not worse--it's the same. I'm sorry that this simple concept is over your head, but it could be worse. Hah, Anon, you think that the New Order isn't growing? 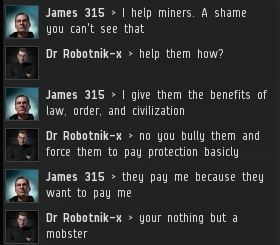 I was a few sectors away from Jita the day before and saw Order agents collecting fees from compliant miners, at least 3. 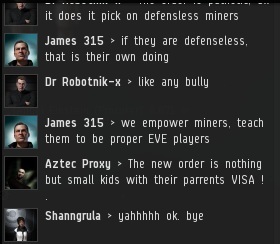 At the end of the day, the miners that do the math realize that it's worth their time and ISK to pay the permits, because not only does it keep them mining, but it keeps them safe from Order Catalyst squadrons. Moreover it drives their prices up. How? As the AFK miners are bumped back and out of range, every second they spend mining is double profits, because their competition is not mining. The truly enlightened can see these truths as self evident and pay quickly. You will be found, you will be bumped, and you will be offered the opportunity to support the Order. Failure to abide will result in your purging.